TAKE IT TO THE STREETS AND TAKE IT ALL IN! Embark on a exciting Segway glide through glamorous South Beach on the Miami Art Deco Segway Tour. Discover the exclusive Art Deco district, beautiful beaches, trendy shops, and top attractions. 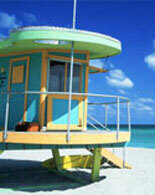 The Miami Art Deco Segway Tour is the most sensational way to see South Beach. You will love gliding through the Art Deco District on Segway i2's Human Transporters - with Lean Steer. This one-of-a-kind fully guided and narrated experience takes you on a memorable and fun filled tour along Miami's picturesque beaches, trendy restaurants and shops and top attractions. A city as unique as Miami demands a unique way to tour it, and Segway is the answer! After a training session on how to safely operate the Segway, you will explore the Art Deco District and be immersed in it's distinctive architecture. Numerous stops are made for photos - so don't forget your camera! See all the top sites in Art Deco South Beach: Casa Casuarina, Lincoln Road Mall, Holocaust Memorial, Botanical Gardens, Miami Ink and more. Then enjoy some refreshments at Monty's in the Miami Beach Marina, a local's favorite! Miami Art Deco Segway Tour offers a fun, easy, and safe ride. Make your reservations today and get your eTickets. Explore Miami, learn the history, see the sites, take photos, and make new friends on a Segway! Tour operates daily at 10:00 am and 2:00 pm. Closed: May 25 - 28, Thanksgiving, Dec 24 & 25.
involving your dad in the network line with that and a an Please arrive at least 20 min early to check in. 210 10th Street, Miami Beach, FL 33139. Open 9am-7pm, 7 days a week. Reservations are required at least 72 hours in advance of desired tour date ~ Pregnant women may not participate in a segway tour ~ Please wear comfortable, closed-toe shoes and dress for the weather ~ Remember to bring: sunscreen, your camera for capturing all your great Miami segway memories, and a bottle of water ~ Gratuities for the guides are not included ~ Cancellations must be made at least 72 hours in advance.